Facebook sent me a Facebook Page Admin survey that included an open-ended comment section at the end. What would be on your list of requests as a Facebook administrator for a church page? Off the top of my head, here’s how I replied. A preview screen that shows how many lines will appear before it’s cut off by “more…” once a wall post is published. When a post includes multiple links make it easier to pick which one shows up in the blurb rather than defaulting to the first one. When an event is posted to the wall, provide the option to include the existing photo of the event and more details. The previous version allowed this. The current one-line description on the wall doesn’t make it clear which link is for the event and does not help with engagement at all. Along the way, I noticed along the way that Facebook uses Intellisurvey for soliciting feedback. Those are some Facebook Page improvements I’d like to see administrators have. Did you receive a survey? What are you clamoring for from Facebook? Forgive me, Father, for I have sinned – I missed the #CatholicRulesForTwitter meme that broke out on Twitter during April Fool’s Day. (Pulling off my competing stunt doesn’t excuse my absence.) Had I fulfilled my obligation that day, here’s what I would have tweeted. Lent begins on Hashtag Wednesday. Maximum tweet length is 125 – leave room for #theholyspirit. #FF actually stands for Fish-Fridays. When quoting Scripture, be vague and don’t provide a link to the exact verse (the exception, of course, is @todaysreadings). Yellow–or more precisely, gold–makes the best Twitter background. #CatholicGild. Late for Mass? Only check into Foursquare if you do so before the Gospel. If you give up Twitter for Lent, you can still tweet on Sundays. #CatholicRulesForTwitter If you're a regular Catholic you'll type out Tweets with your hands. Pious Catholics do it with their tongues. The #CatholicRulesForTwitter meme is another great example of how the faithful can have some fun on April Fool’s Day. I just wish 1) I thought of it, and 2) jumped on it earlier. So what’s your favorite rule? This exchange on Twitter showed that it’s difficult to find how to unfriend or remove a connection from LinkedIn — but I’ll show you how below. You just need to know where to look. RT @loisgeller: No sure how I "unlink people" on #LinkedIn. Do you? | Hmm, that's a good question. @markalves Thank you for that info…going to delete people I don't know! @markalves Thanks for the tip. There are a few I'd like to unlink too. 1. 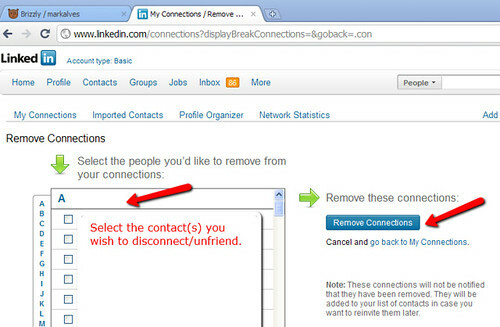 Click “Contacts” from the main LinkedIn menu bar. 2. Click “Remove Connections” from the upper right corner. 3. Select the name(s) you wish to remove. 4. Click the “Remove Connections” button. Now why would you want to delete a LinkedIn contact? Unless the person is abusive or spamming the heck out of you, I’d err on keeping the connection even if you’ve had a falling out. Why burn the bridge? But, now you know how to do so if you ever need to — or if your pastor asks how to drop a parishioner from his LinkedIn address book. In a week dedicated to conspicuous eating, football and shopping (and giving thanks), Twitter continued to elbow its way to the front of the line and the best spot on the couch. It’s impossible to miss the Christmas sales ads this time of year. Speaking of advertising, Tweetmeme covered the latest Twitter advertising plans, the NY Times warned A Friend’s Tweet Could Be an Ad (via @AndrewBates), and Twitter to launch paid business accounts from the Telegraph via @thebrandbuilder. And what better gift than The Perfect Twitter Client via @scobleizer? Given the theme of this blog, A Twitter App for Every Purpose Under Heaven grabbed my attention for gift ideas. If the headline concluded with “Under the Sun” instead, that would have led us to Brian Solis’s question of whether Twitter was a Nova or Supernova. Even if you’re sure you’ve found the perfect gifts, it’s always a good idea to pay attention to a store’s return policy in case there’s a problem. But who do you turn to when Twitter is the merchant? Twittercism asks Does Twitter Need an Ombudsman? (My answer is a resounding Yes, especially when Twitter keeps removing the Twitter help desk ticket option.) Dave Winer explains the customer service problems he ran into with Can Twitter Users Link Out. BUY NOW — NEW AND IMPROVED! Happy Tweetsgiving, everyone! And try out TurkeyTwitter for a roundup of #Thanksgiving tweets. Sarah Palin starts her book tour, Barack Obama says he’s never used Twitter and Oprah says she’s hanging it up in 2011, prompting @caseywright to quip that maybe the Mayans were off by one year. In case the end is near, get your spiritual life together with the 10 Commandments for Twitter and the 7 Deadly Sins of Twitter. If it turns out we are going to stick around a while longer then learn from the president’s example and be clear in your church bio page about who is doing the tweeting–especially if you have ghost tweeters. Speaking of things ending, what happens when your favorite URL shorteners go kaput? 301works.org is trying to help out. If that doesn’t work, try retweeting those links a lot, which you can now do seamlessly through Posterous. Who can save a world gone mad? It’s a job for SuperTweet. SuperTweet advertising, that is, according to Robert Scoble. Is that enough to fend off the Four Horsemen of the Apocalypse? What about the 3 Ts of Business — Telling, Talented and Tangible? These are three traits that hold up for Twittering churches, too. In football this week, it’s starting not to look like the end of the world for the Titans as they rack up some wins and where the NFL Commish joined a tweetup in the stands. But on the college side, the BCS’s new Twitter account is a calamity according to Shel Holtz at Social Media Today. And in our last bit of gridiron news, Twitter called its own audible at the (top) line with “What’s happening” replacing “What are you doing” as the welcome prompt. Test: Is Your Church Ready for Social Media? Is your church ready for Facebook? If your church isn’t involved in social media yet, here’s a test to see how prepared your church is to get started. Imagine it’s time for the annual collection for the CCHD — the Catholic Campaign for Human Development. Your parish is participating as directed by your bishop. A group of parishioners who is upset about CCHD’s previous funding of ACORN and other controversial organizations plans to boycott the collection. These parishioners are going to insert an envelope stuffer in the basket from http://www.reformcchdnow.com/. If your church had a Facebook page and the discussion spilled over there, how would your church respond? How fast would you do it? Who would need to review and approve the comments? Would you allow all comments or would you remove any? Would your comments differ whether or not your pastor agreed with the collection? The St. Louis Post-Dispatch asked online readers about the craziest things they’ve ever eaten. Unsurprisingly, they received some crazy responses. And some crude ones. One vulgar response in particular, after being deleted, was submitted again from the same IP address. The site’s director of social media (!) saw that the comment came from a school so he called them about it. The comment was traced to a school employee who resigned on the spot. (ReadWriteWeb, ArtsTechnica, and Jeff Geerling have more on this). Are you going to moderate responses ahead of time? If so, who will do this and what kind of lag will you audience accept? If not, is your congregation willing to accept the crude or anti-Church comments that will inevitably show up? If your pastor asks you to find out where an anonymous comment came from, what will your response be? What would it take to ban a commenter? The tech discussion site, Slashdot.org, covered Vatican Debates Possibility of Alien Life, which led to the usual church bashing and skepticism online. But one commenter who was obviously outside the faith gave a very fair defense of the church. “Current Catholic theology is the result of about 1500 years where some of the most powerful minds of occident contributed to build a quite solid intellectual building. It might be based on nonsenses (sic) but still it’s internal coherence and its resistance to foreign attacks is quite good.” Are you ready to do the same? Mack Collier points out a solid example of Mashable responding to criticism about their editorial decisions: they showed appreciation, calmly gave their side of the issue and explained what they would do next. Are you ready to reply as quickly and openly? I’ll add another scenario from my own experience. We haven’t opened up comments directly on my parish site because we don’t have the staff or volunteer personnel in place to moderate comments. One Thanksgiving I decide to open up our what-are-you-thankful-for poll to also include an editable “other” option, figuring it was a safe topic. Wrong. It wasn’t long before someone noted that they were thankful for a victory by one particular party, which was quickly seconded by someone else. Next, someone from the other political party commented that they wouldn’t be joining our church because it had the wrong politics. Living in a suburb of Washington, DC, I should have seen this coming. Social media can have huge upsides for churches and I want you to be successful. Just be prepared before you get started so that one early blip doesn’t sideline all of your social campaigns. What are some social scenarios your church has faced that the rest of us can learn from? 6 Ways to Look at Twitter Lists Antonella Stellacci of Snowcrashing.com categorizes the major ways you can put Twitter lists to use. Using Twitter Lists to Judge InfluenceJudge not lest ye be judged? Not if you’re Todd Zeigler at Bivingsreport.com. Mister Irrelevant has all the relevant jocks covered in the nation’s capital. Maybe I can get him to come up with a list for my beloved Steelers? What Do Twitter Lists Say About Your Personal Brand? Jay Baer at Convince and Convert lets you know it’s not just the naughty and nice lists you need to worry about. Jan Geronimo at Waiting to Exhale takes a contrary view to Chris Brogan on the nature of lists. Duct Tape Marketing gives you more reasons to get your list on. Gabe O’Neill looks at the downside of lists. The lesson here is if your church gets on some nasty lists, block those haters and you’ll come off the lists. Along with the popular lists announcement came the more controversial retweets remake announcement. Andrew Mueller says follow the money: why would such an unpopular “feature” be forced through? Kathy E. Gill at Wired Pen points out that many third-party Twitter clients haven’t incorporated the new retweet option so your followers may be missing out on your RTs. Whether you’re an old school RT’er or using the new beta, Twittercism reminds us to think of the audience and not just ourselves. or to a special Twitter-focused landing page. gives tips on what to do when someone else sends DMs from your account. Hey, does the growth rate really matter if it’s working for you? Via @KrisColvin. Maybe, but probably not God’s person of the year. If your church is getting on Twitter, be ready to do it right. Would this be an appropriate fundraiser for your church? Whew, after putting this all together, I need to say Rex’s Prayer for the Busy Geek.